Pick up your Valentine’s Day Exchange cards for Free with your Swagbucks. They have Hannah Montana or Disney Princess cards in packs of 8 for only 20 Swagbucks. There is also a $5 gift card for Red Envelope & ProFlowers that you can get Free with only 14 Swagbucks. 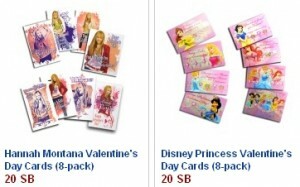 So, if you have been collecting your Swagbucks you can score some free Valentine’s cards and gifts. That works for me because the one thing I hate spending money on is cards. If you are not sure what Swagbucks are you can go here to check it out.